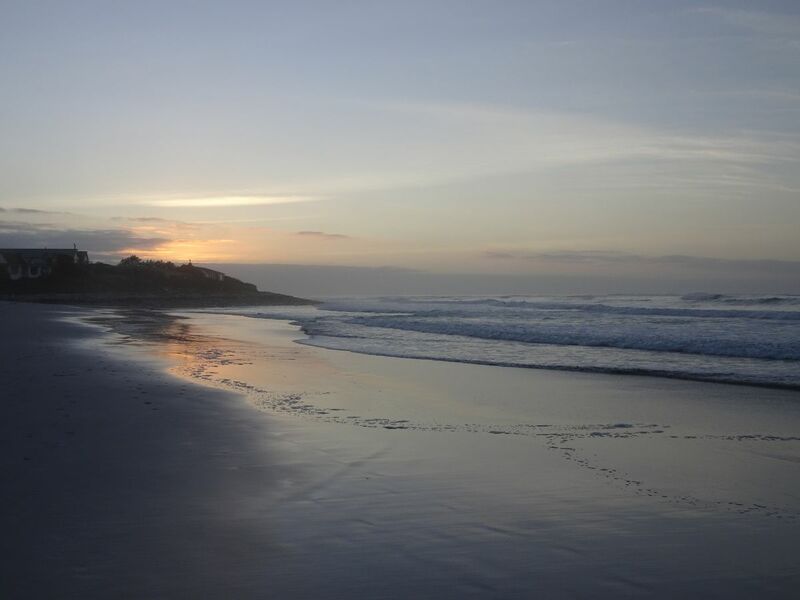 Our hosts Janet and Charles took us out at 6am to look for otters along the beach, which really is dedication to your guests! Okay, it transpires that they always walk the dog fairly early, but still it’s a very kind gesture. So now we know what part of the beach the otters like, but we didn’t see any sign of them. This beach, though, is absolutely gorgeous. Snowy sand, huge crashing waves, turquoise sea, and the grey-green peaks of the northern Cape rearing up across the water. At sunrise and sunset when the golden light glistens on the wet sand as the waves slide back into the sea it’s even more magical. Janet unnerved us a bit with her talk of potential dangers – she has insisted on coming with us tomorrow morning as well, “just in case.” It’s hard to know whether she’s over-concerned or whether there’s a real risk. It is a sad fact that desperate people in South Africa are far more likely to resort to blatant and/or violent crime to try and improve their lot than they would be in, say, Europe. I just can’t visualise those kind of people winding up on Kommetjie beach for any reason. Today, after a bite of breakfast, we struck out for Hermanus past the endless sweep of low-rise suburbia that is Mitchell’s Plain. Once we got back to the wild and rocky coast it was briefly beautiful but then we drove straight into a wall of rain at Rooi Eis. There were some damp baboons at least. But… what happened to the drought that has plagued the Cape this year? Are we “lucky” enough to be seeing the end of it?!? 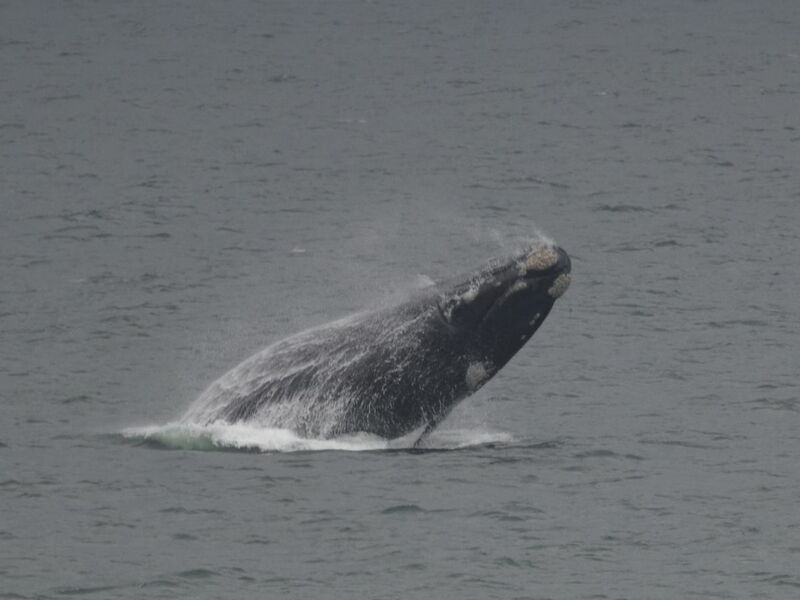 Thankfully the rain had swept on by the time we’d had lunch in Hermanus, and we spent a happy hour watching Southern Right Whales from the town cliffs, some of them in so close you felt like you were looking down at them. There were several good breaches too and I got to try my new monster lens on a tripod. There were even daffy dassies daintily devouring daisies at Fick’s Pool, also in town. 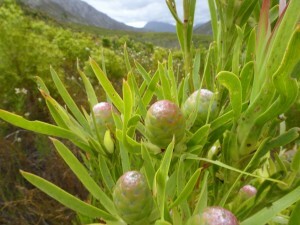 We also squeezed in a beautiful walk in the fynbos of the Palmiet River at Kogelberg NP. 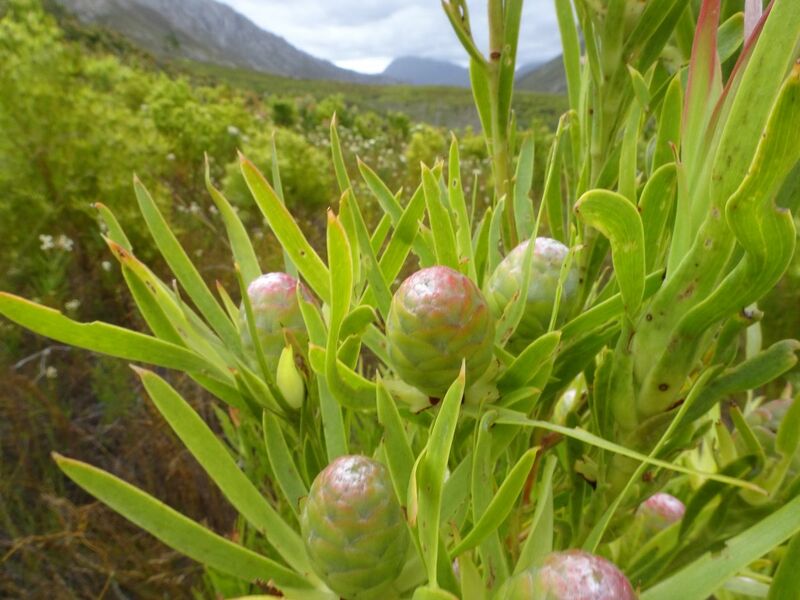 We cut the walk short as we wanted to get back for an evening otter walk (fruitless in the event) so we must come back and do the whole ramble another time – I don’t think the fynbos is more lovely anywhere near Cape Town. The flowering plants are magical, all the more so for clearly being unlike anything anywhere else in the world. This entry was posted on Saturday, October 28th, 2017 at 7:00 pm	and is filed under South Africa. You can follow any responses to this entry through the RSS 2.0 feed. You can leave a response, or trackback from your own site.